"Women In Production Music" session panelists (l-r): Christy Carew of 5 Alarm Music; Alicen Schneider of NBCUniversal Television; Cassie Lord of 5 Alarm Music; Heidi narholz of SONOTON; and Karen Falzone of Mostly Music. "Women in Production Music" session panelists on stage at the Production Music Conference (l-r): Cassie Lord of 5 Alarm Music; Alicen Schneider of NBC Universal Television; Karen Falzone of Mostly Music; Heidi Narholz of SONOTRON; and Christy Carew of 5 Alarm Music. Tyler Bates on stage during the keynote session of the Production Music Conference on Thursday, Sept. 27, 2018. 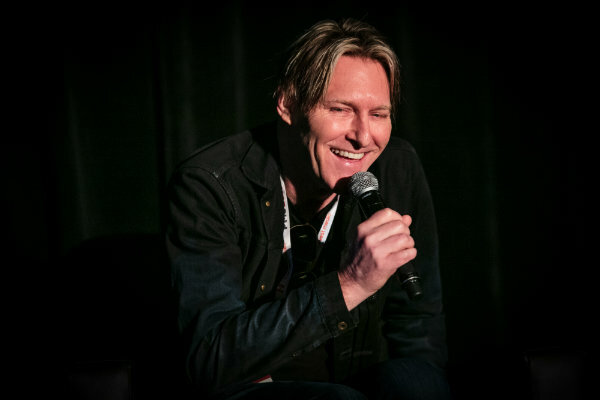 A Thursday morning keynote session set the tone in part as Variety’s Jon Burlingame interviewed composer, multi-instrumentalist , songwriter and record producer Tyler Bates who reflected on his extensive movie work, which includes scoring for the Guardians of the Galaxy, Deadpool and John Wick franchises. Bates noted that he has composed for and scored 70-plus features thus far in his prolific career--and only one of those films, this year’s release The Spy Who Dumped Me, was directed by a woman, Susanna Fogel. Bates said he enjoyed the experience, would like to collaborate again with Fogel as well as hopefully with more female filmmakers. While it wasn’t until his 72nd feature that Bates got the opportunity to team with a woman director, that woeful gender ratio sadly extends to composing ranks as well, according to Christy Carew, composer and music director at 5 Alarm Music. Carew, a panelist at the early Thursday afternoon Production Music Conference session, “Women in Production Music: Styles, Strategies and Survival,” cited a USC Annenberg study which annually reports on the number of female directors in a given year’s 100 highest grossing box office films. In 2015, the USC Annenberg research expanded into the number of female composers. Carew noted that in 2017, out of 100-plus composers for top box office films, only one was a woman--Rachel Portman. Carew noted that it took the extraordinary accomplishments of Portman to break through the ranks. Portman is a three-time Oscar nominee, winning for her score for Emma in 1997, and nominated in later years for The Cider House Rules and Chocolat. Carew added that there are qualified female composers in the marketplace. She herself is one of some 300 members in the Alliance For Women Film Composers. Furthermore Carew noted that there were a number of women selected for the highly competitive Sundance Institute Film Music and Sound Design Lab which took place this summer at Skywalker Sound. She was one of the select group chosen by Sundance and BMI for that Lab. Production Music Conference session panelist Alicen Schneider, head of music at NBCUniversal Television, noted that she rarely gets female composer submissions--perhaps in part because agents have not proactively supported having women composers on their rosters. Schneider said she and her counterparts have had to request female talent in order to help build some momentum for gender equality--but even at that there’s a shortage of name talent akin to the drawing power of someone like Bates, for example. Still the Women In Production Music session panelists themselves underscored that females have made major inroads into the production music industry. Representing the power of inclusion and pushing for more industry diversity are panelists Carew; Schneider; Karen Falzone, founder of Mostly Music; Heidi Narholz, CEO of the preeminent music library SONOTON, and discussion moderator Cassie Lord, founder of 5 Alarm Music. Bates noted that for the second Guardians film, actors had earbuds on set so that they could listen to the music to help shape in part their performances. Bates explained that “the language of the music for Guardians is specific” to those films and that Gunn wanted performers to move and act to that music accordingly. Bates related that his approach to the soundscape for a film is to craft work that is “specific to the story and the storyteller,” meaning he has to be in tune with and understand the storyteller’s perspective and the unique way he or she expresses emotions for that story. Bates said he could write the coolest sounding music “but if it’s not aligned with the sensibilities of his collaborators,” the score won’t work in terms of properly advancing and conveying the story. Furthermore, Bates observed that directors evolve as one project informs another. “Directors are growing exponentially with every film,” he said. So even when he’s worked with someone before, Bates doesn’t assume that he knows thoroughly where his collaborator is at. “I never walk in thinking, ‘I’ve got this,” said Bates, who looks to see how a storyteller has grown and changed in order to best work with him or her in crafting a score. Bates is immersed in a wide range of work. He currently is scoring for an undisclosed video game, continues to score an episode a week for TV series The Purge and The Punisher, is co-composing for John Wick 3, and is collaborating with a couple of other recording artists on album projects. Earlier this year, he again went on tour as a guitarist with Marilyn Manson. The PMA, the advocacy group for the $1-billion a year global production music industry, announced and honored winners of the Fourth Annual Mark Awards, which celebrate excellence within the production music industry. The awards ceremony kicked off the 5th annual Production Music Conference on Wednesday (9/26) evening in Hollywood. During the 2018 Mark Awards ceremonies, Sam Trust received the PMA’s Hall of Fame Award. Trust entered the music business in 1958 at BMI, where he rose through the ranks to executive director of publisher relations. In 1969, he was named president of Beechwood Music Corporation (Capitol/EMI’s U.S. publishing company), where he achieved numerous hits and BMI’s top performing song. In 1971, he established Trust Music Management, and in 1973 was named president of the newly formed ATV Music Corporation, was later named chief executive for ATV Music Group worldwide in 1982, and served in that capacity until 1985. In 1986, he became president and CEO of Lorimar Music Division, and three years later created and was president of Killer Tracks--the company was sold to BMG in 1997. Currently, Trust is retired in Carmel, Calif.
Also during the 2018 Mark Awards ceremonies, Karen Takata, VP, music, at CBS Corporation, accepted the PMA’s Ambassador Award.